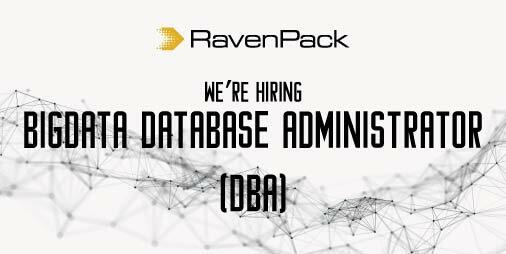 At RavenPack we are looking for a Big Data Database Administrator (DBA) to join RavenPack’s Development Team. As a BigData DBA, you will be reporting directly to the Database Team Leader and will work with an international team of developers skilled in SQL, Python, Java, Common Lisp and Cloud technologies to ensure that all goals are accomplished in a cost-effective manner. As a Big Data Database Administrator (DBA), you will be managing vast amounts of data. Your main responsibility will be applying the best practices to ensure that the organization’s databases are operational, reliable, easily accessible, scalable and secure. You will research, design and implement different technologies and processes to achieve that purpose. You will make the data consistent by creating data backups. You will also be troubleshooting the issues that might appear. Analyzing the challenge of loading and maintaining large datasets: from choosing the best technology and database, design the perfect schema to work with the application level to maintain the sanity of the data. Creating and managing data backups. On-call rotation shifts will be one of your responsibilities. +2 years of experience working as a Linux Database Administrator (DBA) with large amount of data in cloud or equivalent experience. Excellent skills as a database engineer, including ETL (extract, transform and load), backup and restore. You must know when to apply relational OLTP (MySQL, Oracle, Postgre, etc. ), OLAP (RedShift, Presto) or non-relational (MongoDB, DynamoDB) database technologies. Technologies such as ElasticSearch, Hadoop, Hive, Pig, Spark. Amazon Web Services (AWS) technologies, Microsoft Azure or Google Cloud Platform will be strongly considered. Scripting skills in Bash, Python or similar will also be recognized for this position. Professional experience as Linux Sys Admin. Demonstrable knowledge of network design and troubleshooting.